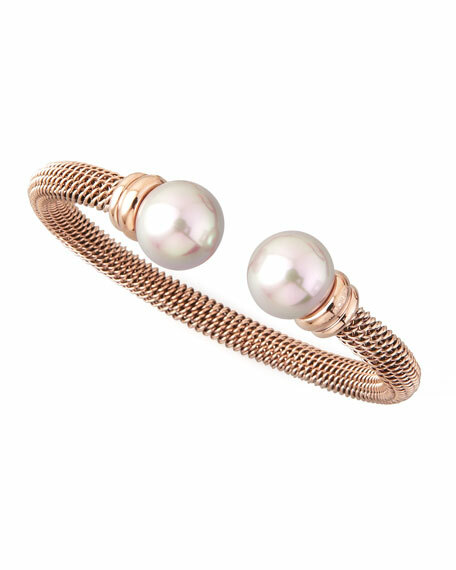 Slim enough to be stacked, yet striking enough to be worn alone, this Majorica bangle is crafted of warm rose gold curb chain and light-lauding pearls. Armenta bangle bracelet from the Old World Collection. Blackened sterling silver with black sapphire pavé. 18-karat yellow gold Crivelli stations with champagne diamond centers. 0.03 total diamond carat weight. Approx. 2.5"D (65mm). Slip-on style. Made in the USA.